With the explosion of the internet, it is easy to access images of people doing incredible acrobatics, amongst other activities, all around the world. These records are not only visually, awe inspiring but also a reminder of the impressive capabilities of human body and what can be achieved with time and dedication. We are the most adaptive species on the planet and capable of so many things when we put our minds to it. 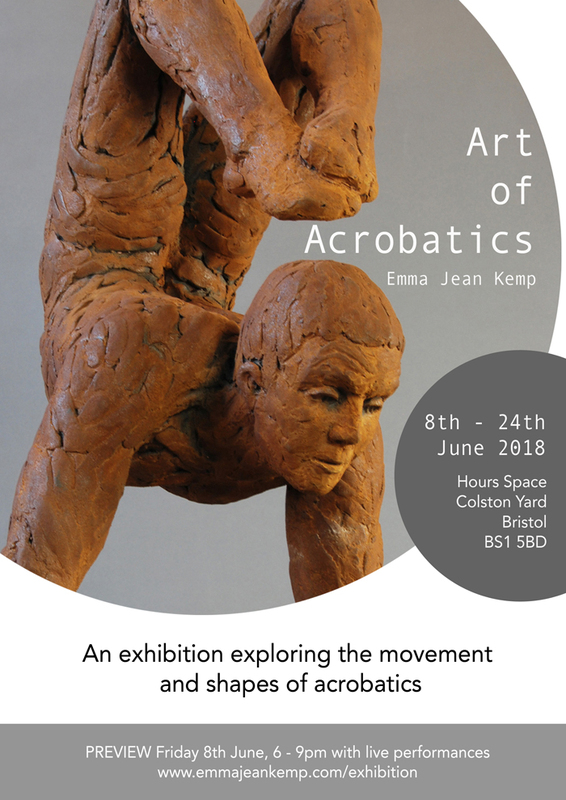 This exhibition will explore some of these beautiful movements, from cartwheels, to handstand variations and somersaults. There will be sculptures depicting the pinnacle of a movement: the moment that is worked at for so long to reach. There will also be drawings and prints illustrating motion through time: exploring the lines and shape of the movement, giving us insight into the exertion that flashes us by. On the opening night there will be some performances by dancers and acrobats, including Capoeira. Opening night Friday 8th June, from 6-9pm. If you can’t make the main exhibition over the weekend, please contact the Hours space directly to arrange a viewing up until the 24th of June. You can ring Sophie on 07766054659.